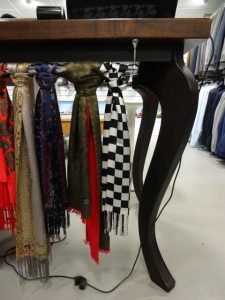 Nestling in the heart of London's historic Camden Stables Market is Modfather Clothing; a lovely building with some lovely clothes (especially the scarves), full of character and, indeed, characters. Over a frothy coffee we got the lowdown on this thriving family business. Tell us about Modfather Clothing. We started off selling classic Café Racer scooter helmets. Our customers were like-minded people and we were frequently asked “Do you know where I can get a decent suit?” or “Can you recommend a good, stylish clothing outlet?” So, five and a half years later, here we are! 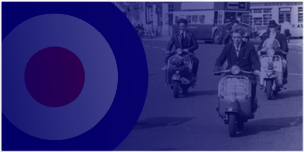 Mods, Skinheads, Suedeheads, Soul Boys, Rude Boys and Scooterists – all are welcome. I suppose you could say we are “very London” – a bit cheeky sometimes. Customers who tell us a suit is coming up small are likely to be told to lay off the biscuits. The shop building is unique, isn’t it? It was originally a horse stable that served the local goods yards. It’s Grade 2 listed, with some lovely original features but it does mean we can’t go knocking down walls. We’ve turned it into a bit of a “man cave”, with our collection of vintage memorabilia, plus some signed bits and pieces from some of our favourite customers. Our Tootal Scarves are on a vintage coat rack. Like everything else in here, it’s a one-off. It adds to that sense of history. Yes, it is pretty unique! You’re in a tourist destination. Is that a help to you? Camden is perfect for us. The shop has become a destination in its own right. 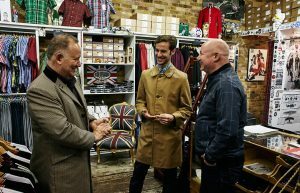 We have regular international customers who make sure a visit to Modfather is part of their London itinerary. They come over for major music events and festivals, things like the International Ska Festival or Le Beat Bespoke, and we’re very much part of their London experience. There have been some great events at the shop, featuring some tremendous live bands and the best vinyl DJ’s. Social media has obviously helped. 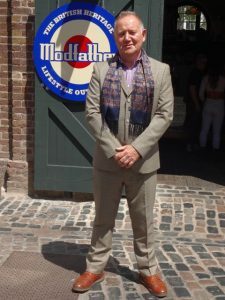 Customers are blogging “Whilst you’re in London, check out Modfather”. We’ve been the final stop off for lots of scooter ride outs, from all over the UK, and even had the Vespa Clubs of both Paris and Bruges driving over for a visit. We are blessed with lots of beautiful regular customers, who are very much our good friends. We always try to offer advice, or a personal service, but only if asked for. Is there a downside to being in a tourist hotspot? Not really. If I had a pound for every visitor who just takes a few photos I could retire now! We’ve sent away a few wayward tourists looking for Union Jack t-shirts but not until we’ve tried to sell them some stylish knitwear! Plus we are in the middle of a music mecca. We’re a hundred yards away from Dingwalls and the Roundhouse, and the front cover of the first album by The Clash was shot a few yards from the shops front door. It’s a family business – is that important to you? Definitely, it’s part of our ethos. We hosted the Kids Go Ska event as part of the International Ska Festival. Lots of toddlers learning how to skank! We had guest DJs, dance demonstrations, talks – it was brilliant. What’s the ambition for Modfather? 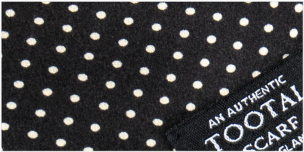 Our slogan is “Modfather Clothing - Attention to detail in Modernist retail”. When that’s recognised all over the world I’ll be happy! 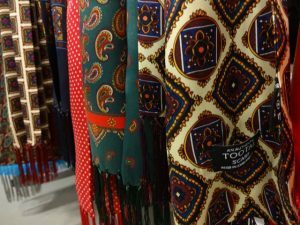 You can find stylish clothing – including Tootal Scarves – at www.modfatherclothing.com where you can also find details of the Modfather Christmas Party at Dingwalls on 23 December 2017. With thanks to Mario, Daniel, Sean, Lucy, Greg, Ben and Dave. 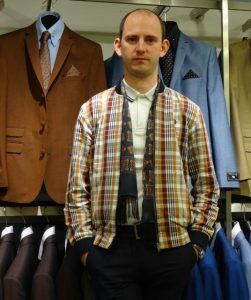 This entry was posted in Customer & Stockist Stories and tagged Stockist, Modfather, Camden, Style on August 21, 2017 by Michael Mulligan. We sat down with Paul, Phil and Graham at Adaptor Clothing in Hertford. 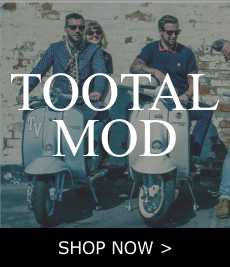 Amongst their vast range of Mod, Skinhead, Rudeboy and Scooterist inspired clothing we swapped notes about who was buying what for whom, when and how. So who is the Adaptor Clothing customer? 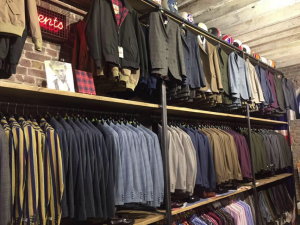 Predominantly male, around 30 to 55, with an interest in all things sartorial. They respect style and have good taste in music. A lot of them would have been Mods in their younger days. They’ve taken their love of that style and made it relevant to their age. And where do Adaptor customers come from? Literally all over the world. I’d call a lot of them Anglophiles. They love and respect the traditional British look, wanting to appear smart and sophisticated. They are equal measures cool and rebellious. What are Adaptor customers looking for? Most are buying for themselves. We get a lot of men coming to pick out a wedding suit, looking for inspiration, the accessories that turn their outfit into something very special. We see a steady stream of birthday present buyers and a lot of gift shoppers around Father’s Day and Christmas. 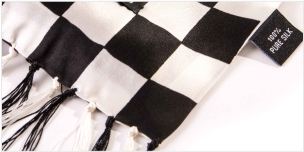 You can’t go far wrong with a Tootal scarf as a gift. 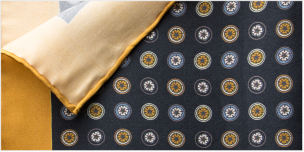 If the pattern doesn’t go with one of your jackets it’s bound to go with another! Are most of your customers shopping online? These days it’s an 80 / 20 split. Some of our customers will research online before making a visit to the shop. Others will have their instore experience first and having found a style and size that works for them their repeat shop will be via the Adaptor website. What the best dressed tables are wearing. So what came the first? The site or the shop? The shop started as a showroom, somewhere we could set up all our ranges to take some photos for the site. When we’d done it, we thought “this looks great, why not try it as a shop?” It’s one of the best things we’ve done, the site and the store support and drive each other, and they create customer confidence. Noticed any changes or trends recently? There are some unusual things that we took a punt on that have surprised us. And there’s a noticeable shift to smart casual sportswear again. The classic, timeless lines will never go away – things like lightweight knitwear, crew neck t-shirts, polo shirts. There's going to be some happy Adaptor customers. What’s the impact if this style crosses over to the High Street? It’s actually good for us. 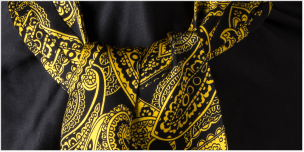 Our existing customers will want to put their spin on it, see how they can wear it a bit differently. 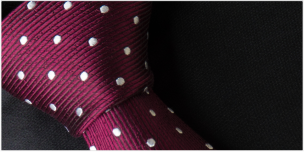 Plus we attract new customers who like the style but don’t want to look the same as everyone on the High Street. This entry was posted in Customer & Stockist Stories and tagged Stockist, Adaptor on July 25, 2017 by Michael Mulligan.